Anybody who wants to understand the law would be well served to read and/or watch Bleak House by Charles Dickens. Consuming Bleak House is a gargantuan task, perhaps intentionally reflecting the ceaseless complexity of the legal case it chronicles, Jarndice vs. Jarndice. The elevator pitch is that two branches of a family fight over an estate for such a long time that the estate is completely drained by legal fees. It’s a valuable lesson (even cited by courts! ), and one that I bring up often when trying to talk friends off of the litigation ledge. But Bleak House would not be Dickensian if it were just the story of a lawsuit. There are countless twists and turns that play out through betrayals and in hushed tones. And because nothing in Bleak House is straightforward, there is even a case of spontaneous human combustion. Deep in the recesses of Chapter 32, Mr Krook, a ragged old man who subsists on a diet of gin, catches fire and dies. This perhaps reflects the belief of the time that drinking excessive amounts of alcohol turned the human body into a flammable substance. Regardless, it brought spontaneous human combustion into the public imagination and it hasn’t really ever left. The concept of spontaneous human combustion is controversial, in the sense that many people believe it is real but most serious scientific minds don’t think it exists. A classic rendition would have somebody stumbling upon a pile of ashes where once stood a person. The surrounding environment would give no indication of a larger conflagration. There are countless examples of this purportedly occurring, although over time instances have subsequently been explained--such as when an Oklahoma man was found to have had a heart attack and fallen atop a lit cigarette. This is about the time in the article where I turn my attention towards torts. And while I am not qualified to pass a legal judgment on spontaneous human combustion, I can indeed discuss its very close and very real cousin: spontaneous combustion. Yes, there are inanimate objects in this world that will catch fire all on their own. They need no flame, and feature no electricity or batteries. This is a real thing and people die because of it more often than you’d think. Example one of a spontaneously combustible thing is a rag or other implement used to apply an oil-based stain and finish to woodwork. As they dry, these substances go through a process of oxidation, a chemical process that can generate enough heat to actually ignite a rag. This is particularly likely when the rags are bunched up in a way that prevents cooling air flow. The phenomenon is fairly well-known among woodworkers, but it is far less known among very amateur homeowners. Picture your average Jane or Joe picking up a quart of an oil-based finish to touch up the deck, and you very well may be imagining the precursor to a fire. Examples of this are endless. Manufacturers do their best to warn of the danger, but we live in a world of unheeded warnings. They also have a fairly fail-safe procedure for dealing with such rags: after use, the rags should be put into a water-filled, sealed can (like a paint can) or laid out to dry on a pavement or concrete surface for at least two days. But that’s a lot to ask of some people, and as long as the curing process for these oil-based products doesn’t change, there will be fires. So if Joe Homeowner starts a fire because he did not understand the warnings and that fire harms somebody else, might liability extend to the manufacturer of the products? Water-based wood finishes exist that don’t have this danger, and one could imagine a world in which all wood finishes must be water-based. The argument is that the end product is not as beautiful, but how beautiful must a product be for us to accept accidental fires? If not extended to the manufacturer, liability would presumably rest squarely on the shoulders of our homeowner. Such was the case in Vaughn v. Menlove, a historic case involving a different class of auto-igniting materials: hay. It turns out that as wet hay decomposes, heat is generated to such a degree that the hay catches fire. In order to prevent such fires, farmers know never to stack hay unless it is entirely dry. The defendant in this case apparently didn’t get the message, and the resulting fire consumed much of the plaintiff’s property. 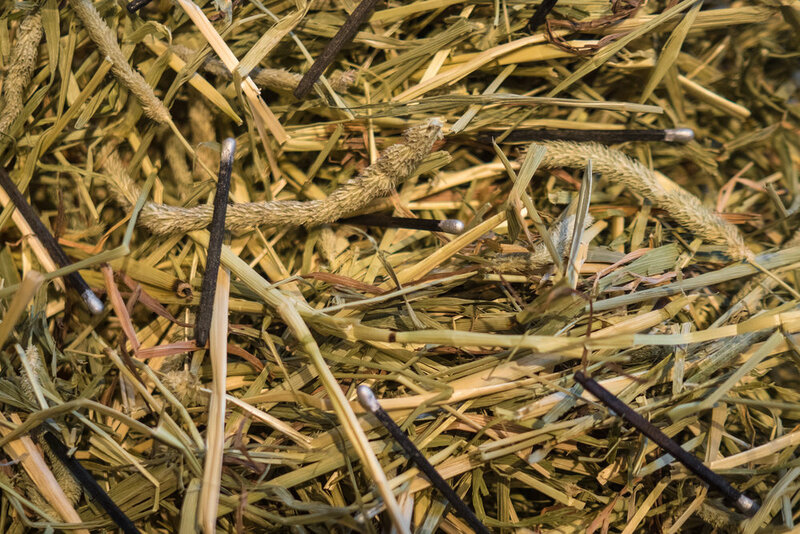 In court, the defendant argued that while most farmers know that you shouldn’t stack wet hay, he did not, and therefore should not be held responsible. The court ruled in favor of the plaintiff, holding that the threshold question must ask what is reasonable to an ordinary person. Without such a standard, defendants could always escape liability by proclaiming ignorance. The homeowner’s ignorance in our deck oil example seems different from that in Vaughn, in that a reasonable homeowner very well might not know about the dangers of improperly stored oil-soaked rags. Still, it is hard to argue that such ignorance should protect the homeowner when confronted by an aggrieved plaintiff in court. Hardly Jarndice vs. Jarndice, one would imagine that the plaintiff would make quick work of a defendant making such an argument.